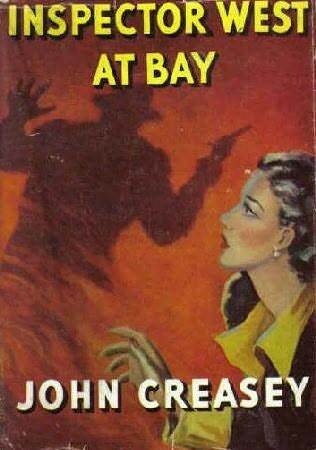 British author John Creasey must surely have been the most prolific writer ever of mysteries, spy stories, and police procedurals. Between 1930 and his death in 1973, he published almost 600 under at least 28 known pseudonyms. He admitted late in life that he himself had no idea of how many aliases he had used. And, unlike Patterson, Grisham and others, he wrote and revised them all himself––on paper, in longhand. By the time of his death, over 80,000,000 copies of his novels had been sold around the world; yet most of his books are out of print and hard to find today, although a few are beginning to be released as ebooks. It's difficult to imagine how he also managed to marry four times, travel around the world twice, found a political movement, and establish the Crime Writers' Association, which still issues the Golden Dagger awards every year. Talk about over-achievers! The Toff was his most prolific series. It featured amateur detective and gentleman the Honorable Richard Rollinson, "Terror of the East End" and his man Jolly. Sixty-eight stories were published over a 40-year period beginning in 1938, and the early ones have wonderful steamy late Victorian Limehouse settings to balance the glitter of the Golden Age ultra-rich to which Rollinson was born. My mother-in-law had a good representation of Creasey books (her basement was chock-full of old mysteries and thrillers; most lost, alas, to a flood before I had fairly begun to dig into them). In the first, Introducing the Toff, Richard is run off the road and shot at while returning from a family visit late at night. A little further on, he finds a car in the ditch with the driver shot dead. Nearby is a woman's dress shoe, but there is no sign of the woman. Rollinson suspects she was in the car that shot at him, either voluntarily or as a prisoner. He notifies Scotland Yard immediately, but for some reason does not tell them about the shoe that he has tucked into his pocket, keeping it as his "personal clue." Another long-running series features the Baron, jewel thief turned antiques dealer John Mannering and his wife Lorna. Written under the Anthony Morton pseudonym, these books remind me a bit of Dashiel Hammett's Nick and Nora Charles stories in their witty stylized dialogue and unabashedly high-class lifestyle. Like Richard Rollinson, Mannering moves in exalted social circles, but unlike Rollinson, he turned to crime to support his comfortable lifestyle. While reformed and working undercover with Scotland Yard in the series, the Baron does not hesitate to use his carefully-honed housebreaking and safe-cracking skills in the pursuit of his personal sense of justice. Like the Toff, his sense of justice and what he does to obtain it does not always quite jibe with the views of his friends at Scotland Yard. Legend has it that the Gideon of Scotland Yard series, published under Creasey's J.J. Marric alias, was born when when a police-inspector neighbor asked: "Why don't you show us as we really are?" So Creasey obligingly wrote 20 police procedurals about Commander George Gideon and his staff. Another four were written by William Vivian Butler after his death. While this is my favorite of Creasey's series, his protagonist would hardly be viable today. Commander George Gideon is both a competent and honest cop and a decent family man who lives in a tidy suburb with a homemaker wife and five children. He is not an alcoholic and never wakes up in the wrong bed; his occasional bouts of depression and guilt are centered entirely around his work and his inability to spend enough time with his family. Nor would Gideon's London be recognizable to modern readers. It often feels more like an oversized village than the bustling, impersonal megapolis we know today. This award-winning series was written between the 1950s and 1970s, and strongly evokes that period in its settings and values better than almost anything else I have read. As in real police work, there are always several cases being worked simultaneously, and not all can be tidily closed by the end of the book. In Gideon's Ride, published in 1963, an accelerating number and variety of crimes take place on London's buses and underground, while certain activists in the transit community are fomenting a strike by damaging property, and the bus conductor who witnessed a mugging-turned-deadly is strangled in her bedroom, despite police protection. To add to Gideon's difficulties, the cases are being worked by three different agencies: Scotland Yard, the Metropolitan Police, and the London Transit Police. Superintendent (later Chief Superintendent) Roger West was another of Creasey's popular protagonists whose adventures were aired as radio serials. Several of the BBC radio episodes can be streamed for free here. I don't remember reading any of these books, although they are well-rated by many who have. Another series I have read a few of is his Department Z series, begun as Hitler was rising to power and continuing through the late 1950s. While they were decent stories for the time, the spy/thriller genre has moved a very long way since, so they seem quite naïve for readers of today. Creasey was better at building complicated plots than at characterization, so many of his characters are defined by exaggerated personalities and circumstances that change very little over the series. Gideon, a later series, is somewhat of an exception, as we can watch his children grow up. Creasey's stories and characters were all very much of their––and his––times. And considering that he published from the early 1930s through the mid 1970s, they cover a scope of social and political changes that few other writers can claim. Many of his books are quite dated now, but for me they are always quick, enjoyable, and nostalgic reads.